Hundreds of thousands of readers saw this image in their newspaper: A woman in a niqab with a bruised and bloodied left eye that you might miss at first glance — but which you can’t un-see once you’ve noticed it. 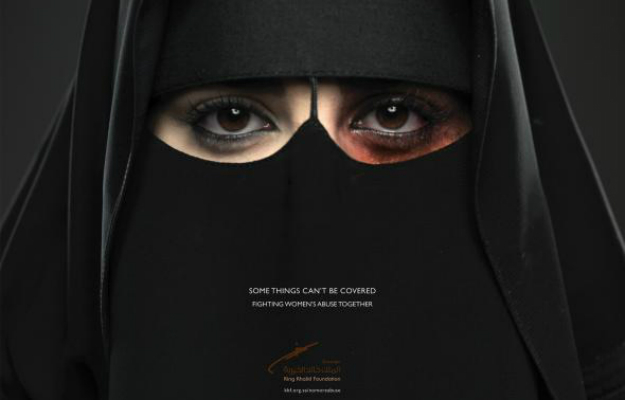 It is a visually compelling advertisement, definitely a strong beginning for a campaign by the King Khaled Foundation to “end abuse in the Kingdom of Saudi Arabia.” The ad featured an anti-violence slogan, followed by a list of numbers to report cases of domestic abuses. In an ultra-conservative environment that has routinely avoided dealing with such issues, the campaign is a welcome breath of fresh air. The campaign’s website [Ar, En] jumps head-first into the topic, admitting that Saudi society has generally denied the phenomenon of domestic violence and asserting that “no one sees the full extent of the phenomenon, its actual breadth, its underlying reasons, and its effects.” It also offers a 12-page study [Ar.] and call for action, listing steps necessary to create local institutions to support protection for vulnerable women and children, increase awareness in society, and create shelters for victims when necessary. Soon after the campaign’s first public newspaper advertisement came the first TV spot on domestic abuse, featuring a man violently beating two crash test dummies — which then morph into a woman and child, cowering in the corner. The voiceover then quotes the prophet Mohammed urging people to be gentle in their dealings with people. It ends with a call for reporting cases of domestic abuses. You don’t need to understand Arabic to appreciate the message — or the possible shock value of the ad. « FSA Cleric says: “It’s Permissable to Kill Women and Children” – USA Supporting Terrorist Extremits.